hair removal laser, delivering permanent hair reduction quickly, comfortably and effectively. pigmented and vascular lesions and wrinkles. And only Candela lasers feature the Dynamic Cooling Device (DCD™) to maximize patient safety and comfort. facial and leg veins, age spots and rejuvenating the skin on the face. The GentleLASE System, a revolutionary long-pulse high energy laser emits a gentle beam of light that harmlessly passes through the skin where it is absorbed by the target. The laser energy is transformed into heat, leaving the surrounding skin unaffected. The skin is further protected during treatment by a Dynamic Cooling Device™ where cryogen is sprayed onto the skin cooling the upper layers and providing patients with increased comfort. The GentleLASE selectivity helps to protect the skin, while effectively treating the unwanted hair, vascular or pigmented lesion, or wrinkle. The GentleLASE can treat leg veins, blue facial veins, venous lakes, and hemangiomas and port wine stains, pseudofolliculitis barbae (PFB), and wrinkles. The GentleLASE laser treatments include melasma, cafe-au-lait, freckles, and solar lentigines. Fine lines and wrinkles can also be treated using our GentleLASE technology. Laser hair removal for everyone regardless of skin type. Imagine having smooth, hair free skin without shaving, waxing, plucking, or bleaching your unwanted hair. Using the latest Candela laser technology known as the GentleLase lasing process, we now offer safe, fast, effective treatments for both men and women. Unlike other treatments, the GentleLASE process is easy—requiring no creams or gels, no pre-treatment waxing, and no needles. In fact, laser hair removal is a medical breakthrough. Treatments are comfortable, treating hair follicles in a fraction of the time of other methods, using only the gentle power of laser light. Traditional hair removal techniques, such as shaving, plucking, waxing and depilatory creams provide only temporary relief. Until now, the only recognized way to remove hair permanently has been by electrolysis - which can be tedious, time-consuming and uncomfortable. 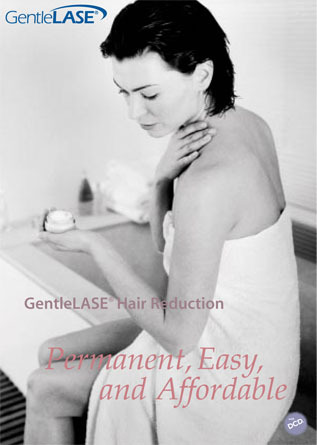 The GentleLase System safely removes unwanted body hair without damaging the delicate pores and structures of the skin. Facial and bikini areas are usually completed in under ten minutes; legs, backs and larger areas can take longer.